On June 16, 1925, a monument dedicated to Alexander Ross and Margaret Noble was unveiled by their descendants at the pioneer Bethel Cemetery [located on the north-east corner of Lot 11 N½ Concession 10 of Arthur Township, north of Farewell]. The girls [centrally located in the photographs], who unveiled the monument, were Margaret Ellen Ross (G2F), Marjorie Isobel Ross (A8D), Jessie Margaret Ross (A3A1) and Ethel Euphemia Ross (A3A2). 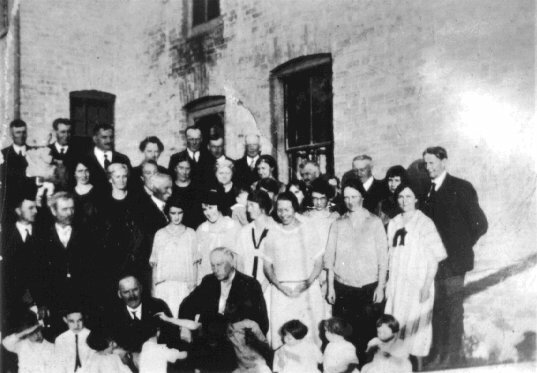 The minister, Reverend Gilbert Gomm, and some members of the recently renamed Zion United Church in Cotswold were invited to join the descendants. The above pictures were taken back at the home of John Alexander Ross after the ceremony. Peter H. Ross (A3D) had a major responsibility for the items required for the supper [and $13.28 fed about 50 persons!]. 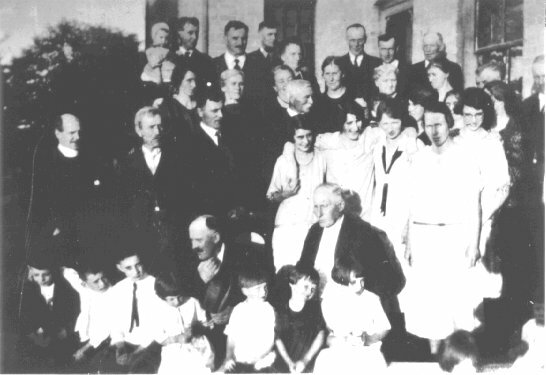 This gathering was a fore-runner to the annual Ross Family Reunions which began in 1929.